Hi everyone! It’s time for the My Favorite Things release replay! Today, the MFT design team is taking a fresh look at the most recent release. I used the fun cook and the kitchen utensils from the set that I colored with Copic markers. I die cut them with the coordinating Die-namics. The background pattern was created with the Gingham rubber stamp that I stamped with Chili Powder dye ink on white cardstock. I then attached the panel onto a scalloped square that I cut from the Stitched Mini Scallop Square STAX die. 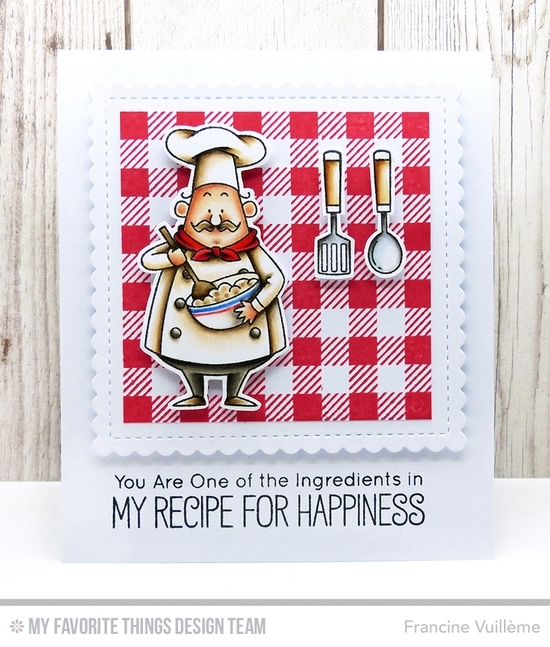 The sentiment is from the Recipe for Happiness set too. I am always in awe with your coloring...wow, wow, wow!!! Love this beautiful and fun card Francine! Wauh and super coloured wich nr have you used for the " white"
So beautifully colored! I love that red gingham background too--perfect!